When the winter winds blow, sometimes they take out the power. Those extreme cold temperatures can have you feeling the cold in no time if you don’t take precautions immediately. Some of these are relatively simple, such as closing the curtains or blinds to retain heat and plugging the opening under the door to prevent the cold air from coming into the house. In fact, you may already be doing these things. The words, “plug the pneumonia holes” was a phrase I often heard as a child. 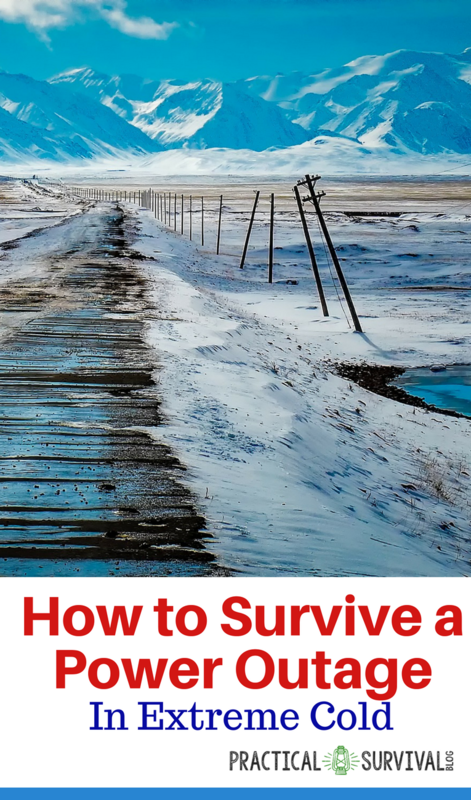 So, here’s how to survive a power outage in extreme cold. If you don’t have a thermal or blackout shade or curtains, it’s a good investment even if you have power. You can find some blackout curtains here. These window treatments can help keep your home cooler in the summer and warmer in the winter. The curtains are far better at blocking cold air and hot summer sun, but the shades do quite well too. They are no longer the black shades used at assemblies when movies were shown but come in decorative colors and designs. Even if it’s snowing outside and you want to see how high the snow is, avoid the urge to open the door. It’s not worth it and will let out the heat while bringing in the cold. Bundle up. Use your flashlight to get out warm clothing once you’re certain the power is going to be out for a while. Get extra blankets out for everyone too. While you won’t be able to use your oven, if you have a gas stove, plan on cooking a big pot of soup that comes to a rolling boil. The heated water will warm the house. It also is a great way to use some of the food in the refrigerator and freezer. Do not attempt to use the stove just for heat. It was meant for cooking, not heating. Using it too long could cause the buildup of carbon monoxide which will kill your family faster than the cold air. If you have direct sun coming in the window during the day, open the shades and let it shine onto a large black or dark blanket to heat the room with ambient heat. Another alternative is to build a solar convection heater to fit into your window before the outage occurs and take advantage of the sun’s warmth. If the estimated time for the outage is over a day, move refrigerated foods to a cool area and freezer foods to a cold one. It’s one advantage of power outages in the winter. Build a fire in the fireplace or use a safe heating source. Close the doors of all exterior rooms. Live in one or two rooms. Your body heat will help warm the room and the space to heat will be smaller if you use an interior friendly heat source, such as a kerosene heater or propane heater. If you haven’t prepared for an emergency yet, make sure you start preparing now. 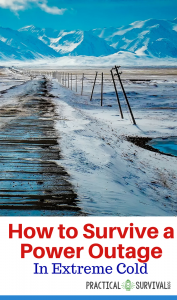 A great first step is by reading Practical Survival Preparedness: Surviving an Unexpected Emergency. You can find out more info here.